The Regional Archives Maribor is actively involved in preparing some of the cultural events, which will take place in Maribor in time of its being the European Capital of Culture. The Regional Archives Maribor will prepare exhibitions of archival holdings kept in its fonds and collections. 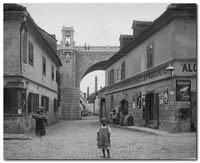 From the vast collection of old postcards and photographs of Maribor at The Regional Archives Maribor, a few rarely seen pictures were chosen. These pictures show the city itself, the buildings, the cityscape, street pubs, events taking place in the city center, and the people who live there. The images reflect the period they were taken in, thus enabling the viewer to reflect on the way the city has changed and providing insight into which other changes are needed. The images are shown in display windows at pubs and inns in the old city center, and tell the story of the diverse and ever-changing city. 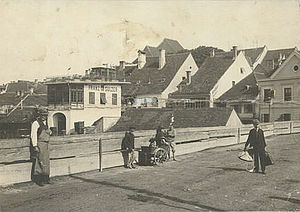 Photographs and postcards are dated between years 1870 and 1970. Those somewhat nostalgic will be delighted about the catalogue of the photographs displayed, which they will be able to use as postcards. The display window exhibition will be accompanied by an outdoor exhibition of photographs from the 1930's. These photographs show the inhabitants of Maribor in movement, while they are walking, which gives the photographs the appealing sense of liveliness. The life-size photographs will be placed into the street one after the other, giving passers-by the feeling of just having encountered those who lived here in the past. The »Germans and Maribor« exhibition will be the central exhibit at the exhibition grounds in the former Velika kavarna building. It will highlight the role of the Germans in Maribor, which is always present in the people’s subconscious but has never been presented in detail. The exhibition will emphasise the fact that the Germans had an important role in the development of the town from the time of the formation of a Slovenian identity up to the end of the World War II. The Germans were an important town-building element because of their demographic relationships and economic and political power. The exhibition will present the creation process of two ethnic communities in Maribor and highlight the presence and the role of the Germans in the Maribor political, cultural, economic, and everyday life in various time periods and in various historical contexts. One part of the exhibition will also present events in the town and emphasise creative individuals and everyday life practices. 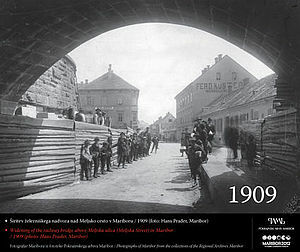 The purpose of the exhibition is to encourage spectators to think about whether the population of Maribor was really divided into two ethnic groups at all levels of life from the mid 19th up to the 20th centuries. Based on its sources, the Regional Archives Maribor will prepare marking boards for houses and an exhibition of selected building plans and specifications of houses in the city center. The two projects uncover the circumstances in which the buildings were constructed and the way the city center developed, making comparisons to today’s circumstances. Buildings that may not house public institutions but have an interesting past because of the way they were constructed will be chosen. Crucial information will be put on informative boards, and additional information on selected buildings will be included into a publication. The boards will provide the locals and visitors with information about the role a building had in the past. While boards are usually placed on important buildings and houses, in which notable individuals were born, this project will do the opposite – it focuses on everyday stories about people and their homes, revealing how they spent their lives. The exhibition closes in May 2012, while the boards will stay on the houses. The author Žiga Oman presented Protestant Maribor in his master’s thesis. The exhibition will feature his most interesting findings. The exhibition portrays Maribor and its surroundings during Reformation and Counter-Reformation in the sixteenth and early seventeenth centuries. Emphasis is given to the golden age of Protestantism and the demise of Maribor’s Protestant community between 1587 and 1602. The exhibition will present all important parts of the history of Maribor’s Protestant community, which is a relatively unknown but important part of Maribor’s and the Drava Valley’s history.